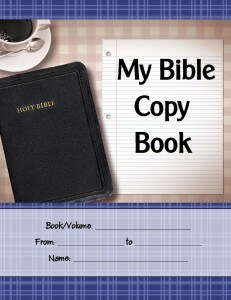 Welcome to the My Bible Copy Book ebook series! Recently I have been inspired by several articles and blog posts I have read online. I have been inspired to begin copying the Bible in a more systematic way. Not just a few verses here and there, but whole books of the Bible at a time. In the Old Testament, the kings were instructed to “write for himself a copy of this law on a scroll.” There was a reason for this instruction and I think it applies to us today as well. Copying Scripture forces you to slow down and really think about each word you are writing, allowing the Lord to speak to you through His Word. I am offering this ebook series as a FREE DOWNLOAD…my gift to you! Both the Old Testament and New Testament are now complete! NEW! Blank My Bible Copy Book Journals! 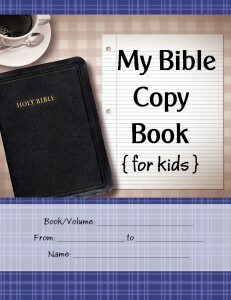 You can now purchase blank My Bible Copy Book journals for you and your children! If you like the idea of having nice bound copies to keep and treasure, you will want to check these out. Each book contains 150 “Notes” pages and 150 pages for copying the Bible. There are two versions available, one for younger children and one for older children and adults, and are available at Amazon. I don’t have the “Look Inside” feature added to the books yet, so I have included links to sample files below for you. Click on the covers below to go to the books on Amazon! Click here for a sample of the older version. Click here for a sample of the younger version.